Airbnb has become another global platform to turn travelling experience upside down. This extremely popular space became a true community with an abundance of options and opportunities for everyone... at a reasonable price! The most exciting part is that this cluster offers truly diverse adventures by renting a single room, apartment or a suite, a houseboat, a yacht or even a castle - and you’re packed with a totally fresh experience! As far as this travelling experience becomes more and more popular, let me first outline this - once you’re finished reading the article, you’ll know the trends and opportunities within the industry as well as understand the app like Airbnb cost and procedure. You will also be able to calculate the price for each desired feature and decide which ones you really need. Overall app cost factors and features approximate pricing. solo travels - this stack grows from year to year significantly, and destinations adjust their services and products for these folks - 35% is a big number of people, and they are more open to interact with local culture through various experiences as they are totally dynamic and free to choose. 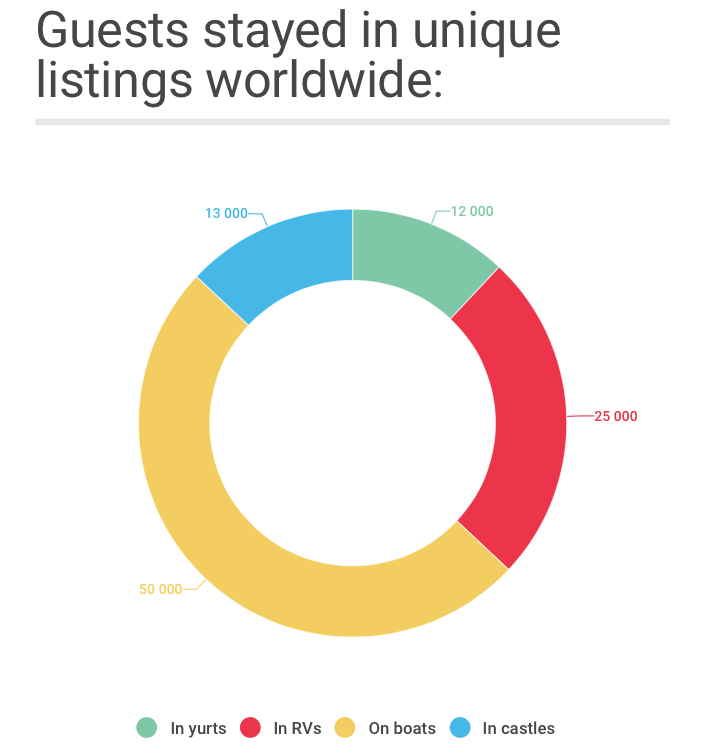 It goes without saying - this game-changing travel format becomes growingly popular, and Airbnb appears to be not the only platform for listing and booking accommodations around the globe. Some other companies make an app like Airbnb and hit the court with their offers. Roomorama - another safe service which requires users to confirm their best intentions in sharing houses with guests - personal IDs, bills and personal picture help ensure this too. Let me start this part by saying that there are some factors, which influence the cost to create an app similar to Airbnb. Not to mention, you can choose diverse modes of crafting it which is likely to project onto Airbnb app development cost as well. design - custom vs. standard - if you prefer some unique visuals and tools instead of ones based on pre-built sets, it’s about to change price quite a bit too. Moving to particular features, it’s important to mention - rough timing indicated below covers all stages of creating a feature - from drawing logics to testing. Elements are also listed from basic and simple to additional and complex. So let’s dive right into how much does it cost to develop an app like Airbnb. This is one of the fundamental segments of any app. To start using it you need to register and, this way, agree with the conditions and policies of the app usage. For your development team implementation of this component can take around 10 to 16 hours. Execution of this part would take around 16 hours. It would take about 24 hours in total to build this infrastructure. That is the way to go after the user is all registered and set. Fixing a host requires placing details on the type of housing you offer as well as pricing, photos, etc. As far as this feature is quite wide, it will take developers around 24 hours to construct. So once you’ve executed all desired filters, you see a list of search results. Every item in this list has a wider description with ratings, photos, reviews, available dates, map and terms of getting the place. Mainly, this feature makes a skeleton for users to select the option they like. Therefore, it can reach up to 150 hours for developers to build and set up everything within. That is a visual and easy alternative to searching for your perfect location - just check various ones on the map, tap to check if it’s important for you to stay near definite sites or something. It is to take about 24 hours to frame this one. If you decided to rent out your place, then you create a host account, fill in all the necessary details and app then shows you how much can your house/apartment/room cost. This is the full function, which enables hosts to place adverts, communicate with potential habitants, provide booking and stuff. And it’s estimated to take about 100 to 120 hours of development. This feature allows users to create their personalized shortlists of locations to be able to come back to these at any time, pick and choose. 10 to 12 hours is the average time to implement this important button inside the infrastructure. This is a truly meaningful tool for communication of any sort within a community. Live talk opportunity makes users feel high reliability and authenticity of the service and its’ participants. Up to 40 hours is an approximate time for implementing this item. Not much to say, you can recommend the app to your friends through invitation. It usually takes about 10 to 11 hours to craft the feature. This is basically a button, enabled through the Google translator, which converts any description into your mother language. And it will usually take about 3 to 4 hours of development time. This element will show some complementing sites and other must-visits near chosen location. Very personalized and convenient, isn’t it? It costs around 10 hours of developers’ work. Each feature you decide to pick for your product requires time to craft and configure on both client side (how it interacts with a user) and server side (functionality, connections with servers, etc.). The server-side stack is crucial as well as wide scale part of every app building process. It’s also going to be the most time-consuming one. After all, you want an app to perform as a killer, right? You’ll need to add around 600 hours for these operations to the entire timing. And now, when we’re done with calculating time for crafting your Airbnb-like app, it’s the right time to choose who will implement it for you. It basically covers a cash part of the question “how much does an app like Airbnb cost”. It’s just the time to finalize an overall development cost for your Airbnb-like application internationally, guys. Eastern Europe experts are famous for their high professionalism together with moderate pricing, so they are worth considering for sure. Australian and American professionals are paid the highest out of this range - it’s expected for the regions anyway. No need to worry about quality and all the procedures. Search and pick a development team, bring your idea and start the discussion - believe me, it will take some time and experience till you start the development itself, so the time is now! Best of luck and see you in Featured Travel Apps List soon!